What do I have in my garden right now? It’s mostly a dry wasteland, but there are some nice red peppers, a lone basil plant and some hardy oregano. Here’s a salad to use what I’ve got. If you do not have these exact vegetables, this recipe is open to improvisation. 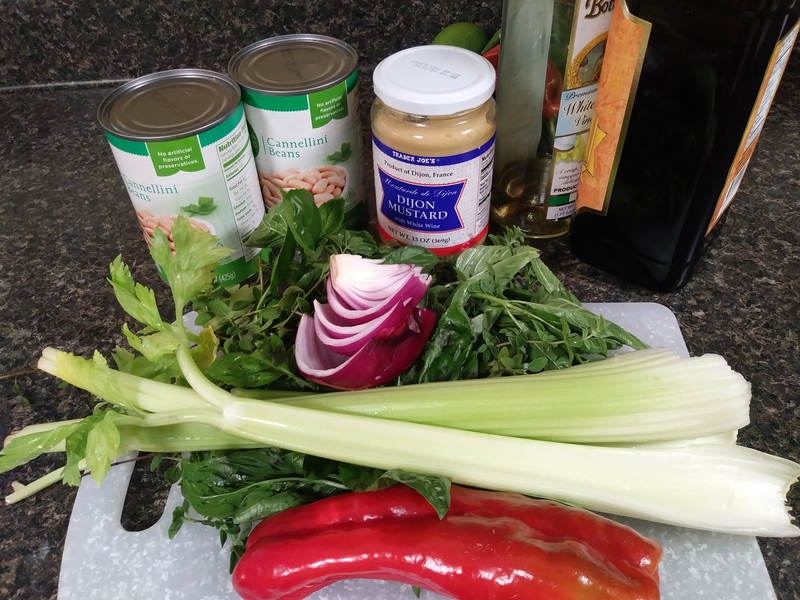 For example, you could leave out the celery or substitute cherry tomatoes for the red pepper. Also, this dressing is pretty punchy, so you could tone it down with a little less dijon or vinegar. I love this salad because the main ingredients are pantry staples that I always have on hand. It’s easy, nutritious and delicious. Begin by chopping the onion and placing in a small bowl. Add 2 Tablespoons vinegar and about 1/2 teaspoon salt and set aside. Chop the remaining vegetables and herbs and set aside. In a medium bowl, add the dijon and remaining 1 Tablespoon vinegar along with the olive oil and pepper. Whisk or stir rapidly with a fork until creamy. Add the onion and vinegar mixture and stir to combine. 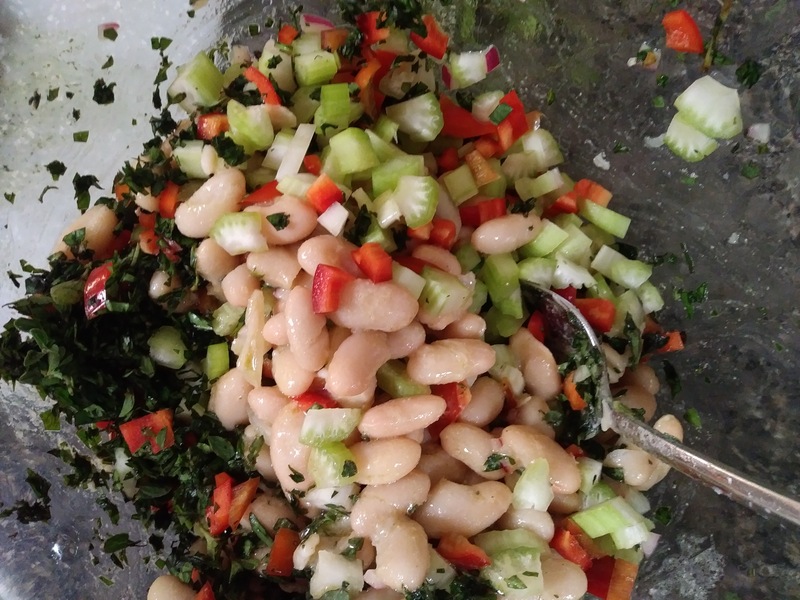 Add the beans, pepper, celery, and herbs then stir gently to coat all ingredients in the dressing. Let the salad rest and marinate for 10- 15 minutes or place in the refrigerator overnight. This will get tastier as the flavors mingle and will be delicious for 3 or 4 days. Serve as a side dish or on a green salad. There are a few food bloggers that I’ve been following for many years. When I see their emails in my inbox, I know they’ll provide consistently delicious recipes that are interesting but not too difficult. Clotilde at Chocolate and Zucchini is a food writer living in Paris. She sends out a monthly post with a round – up of recipes, restaurants, and other tidbits. 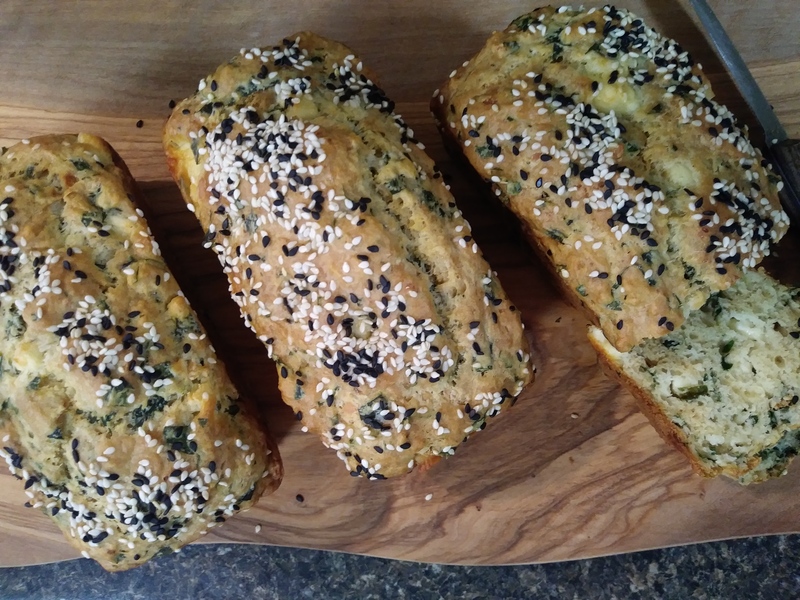 This month provided a gem of a recipe: a savory quick bread with feta cheese and lots of fresh herbs. There’s no yeast and no rising time, if you can make banana bread then you can make this! Everything about this recipe is perfect. The sesame seeds provide a subtle, nutty crunch, and the salty feta cheese in a soft rich bread hits all the right notes. The basil makes this bread very seasonal for late summer, but any other herb or combination of herbs would work just as well. Clotilde kindly includes converted measurements since Europeans measure baking ingredients by weight instead of volume. I have ‘Americanized’ this recipe even more by using buttermilk in place of the yogurt and making a few other small changes. However, her version is absolutely perfect so if you have some plain yogurt in the fridge please click through for her recipe. Preheat oven to 350 degrees. Prepare 1 full size bread pan or three minis (which is what I used) by smearing with butter and sprinkling in 1 Tablespoon sesame seeds. 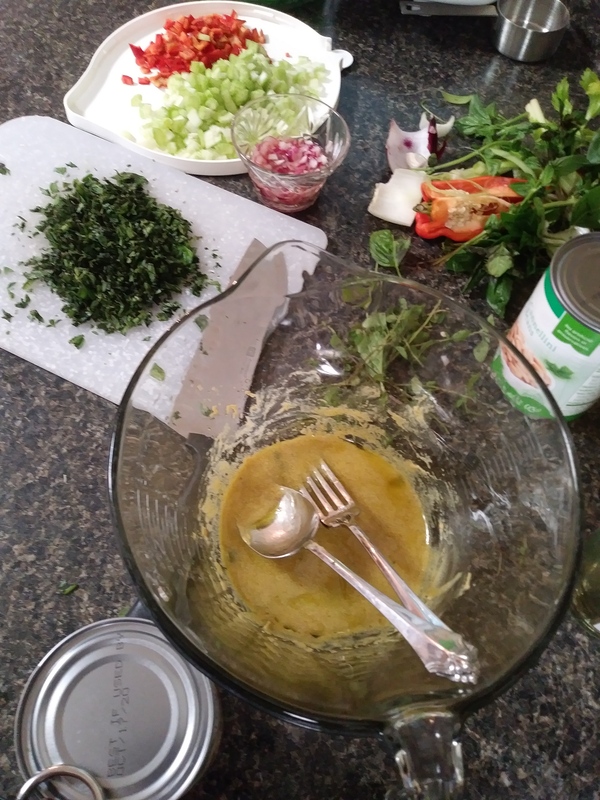 Chop the herbs (here’s a post that includes directions for chopping basil) and crumble the feta cheese. Set aside. Combine the flour, baking powder, baking soda, salt and pepper and stir well with a fork or whisk in a medium bowl. 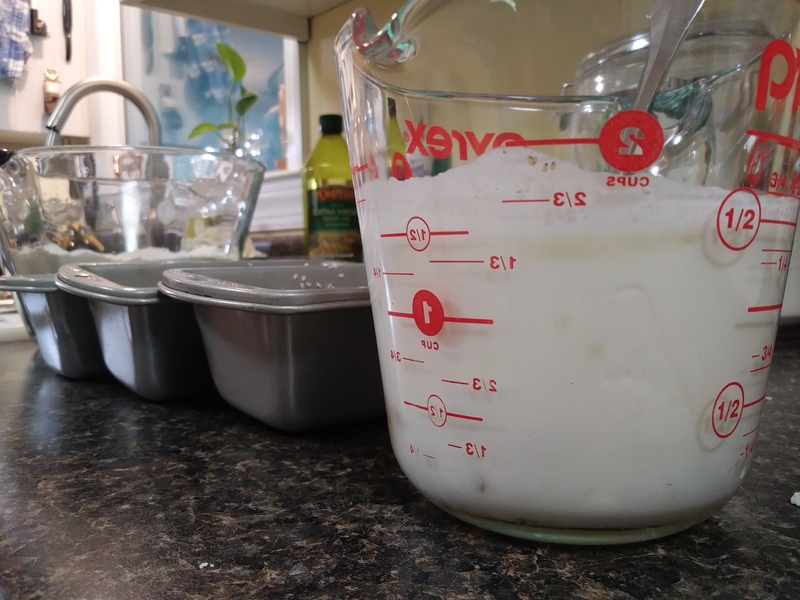 Using a 2 cup or larger liquid measuring cup (such as the one in the picture), measure the buttermilk and oil, then add the eggs and mix well. Pour the wet ingredients into the flour mixture and stir gently. When the mixture is still very lumpy, go ahead and add the herbs and cheese. 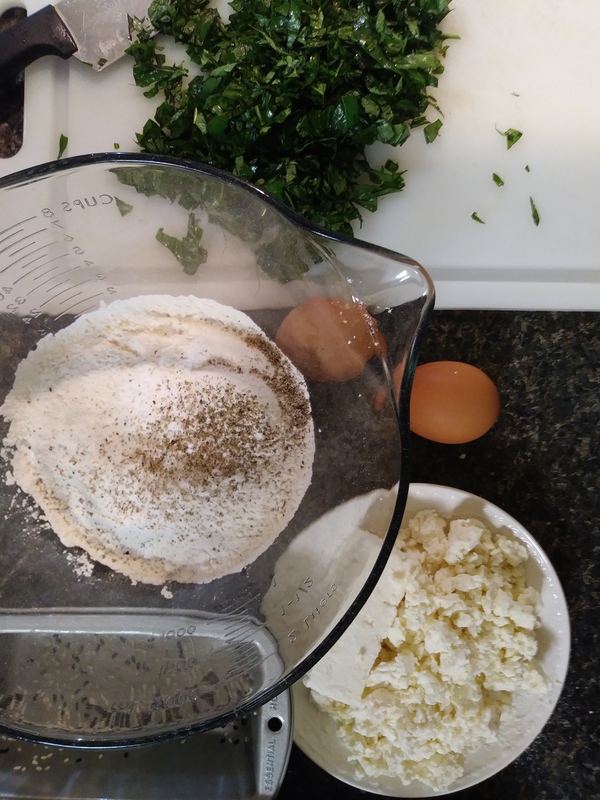 Mix until just combined (do not over mix or you will develop the gluten and make the bread tough). 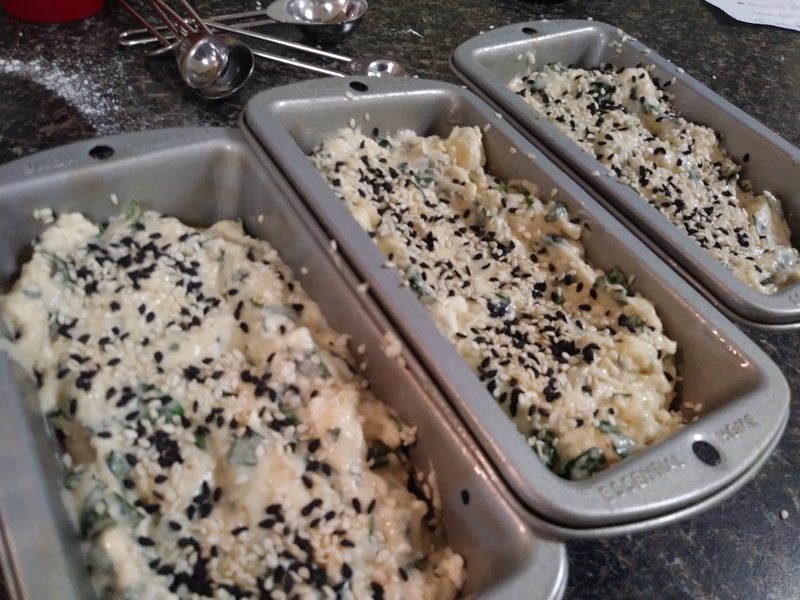 Spread into prepared pans and top with remaining sesame seeds. Bake 40- 50 minutes or until a toothpick inserted in the center comes out clean. Cool in pans 10 minutes then turn out to finish cooling and allow the crust to crisp.